He has recorded more than 20 studio albums, charted over 40 singles on the U.S. Billboard charts as Hot Country Songs, and has sold more than 26 million albums. He has been honored by the Country Music Association with 18 CMA Awards, including two Entertainer of the Year awards and five Male Vocalist Awards. As of 2017, Gill has also earned 21 Grammy Awards, more than any other male country music artist. In 2007 he was inducted into the Country Music Hall of Fame. On February 4, 2016, Gill was inducted into the Guitar Center Rock Walk by Joe Walsh of the Eagles. In 2017, Vince Gill and Deacon Frey were hired by the Eagles in place of the late Glenn Frey. Vince Gill was born in Norman, Oklahoma. His mother had a son, Bob Coen, from a previous marriage. He was Gill's half-brother, but was considered a full brother by Gill. His father, J. Stanley Gill, was a lawyer and administrative law judge who played in a country music band part-time and encouraged Gill to pursue a music career. His father encouraged him to learn to play banjo and guitar, which he did along with bass, mandolin, dobro and fiddle. Gill attended high school at Oklahoma City's Northwest Classen High School. While there he performed bluegrass in the band Mountain Smoke, which built a strong local following. After graduating from high school in 1975, he moved to Louisville, Kentucky, to join the band Bluegrass Alliance. Afterwards he spent a brief amount of time in Ricky Skaggs's Boone Creek band before moving to Los Angeles to join Sundance, a bluegrass group fronted by fiddler Byron Berline. Gill debuted on the national scene with the country rock band Pure Prairie League in 1979, appearing on that band's album Can't Hold Back. He is the lead singer on their song "Let Me Love You Tonight". Mark Knopfler once invited him to join Dire Straits, but he declined the offer (although he sang backup on the Dire Straits' album On Every Street). He provided background vocals for the song "Tennessee Line", from Daughtry's second studio album, Leave This Town. Gill left Pure Prairie League in 1981 to join Cherry Bombs, the stage band that backed Rodney Crowell. There he worked with Tony Brown and Emory Gordy Jr., both of whom would later produce many of his albums. He recorded a bluegrass album, Here Today, with David Grisman and friends before signing a solo deal with RCA with whom he achieved some success including the singles, "Victim of Life's Circumstance" (U.S. Country Top 40) and Country Top Ten with "If It Weren't for Him", "Oklahoma Borderline" and "Cinderella". However his albums achieved only moderate sales and in 1989, Gill left RCA to sign with MCA Records. Here, reunited with Tony Brown as producer, he sold over a million copies of his label debut, 1989's When I Call Your Name, of which several songs, including the title track, made the U.S. Country charts' Top Ten / Top Twenty. This was followed by the similarly successful albums, Pocket Full of Gold (1991) and I Still Believe in You, of which the title track went to U.S. Country No. 1. Throughout the 1990s and into the 2000s Gill continued to release highly successful albums, capitalizing on the virtuoso quality of his electric and acoustic guitar playing, his pure, high and soulful tenor voice, and the excellent quality of his songwriting. According to his biography on AllMusic, Gill has won more CMA Awards than any performer in history, and as at 2018 has also won 21 Grammy Awards, which represents the most ever by a country artist. Gill has been a member of the Grand Ole Opry since August 10, 1991. He celebrated his 25th Opry anniversary with a tribute show on August 13, 2016. In 2010, Gill officially joined the country swing group The Time Jumpers. In July 2011, Gill appeared as a guest on NPR's news quiz show Wait, Wait...Don't Tell Me. Also in 2011, he appeared on the second of two bluegrass tribute albums for the British rock band The Moody Blues: Moody Bluegrass TWO... Much Love (2011). In May 2011, Carrie Underwood was one of the seven women to be honored by the Academy of Country Music at the Girls' Night Out: Superstar Women of Country special. 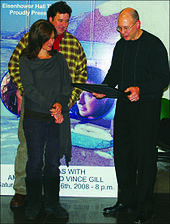 At the ceremony, Gill introduced Underwood and presented her with the special award. He sang one of her hits, "Jesus, Take The Wheel", and joined Underwood on a rendition performance of "How Great Thou Art". The video of the performance went viral within two days. In February 2012, Gill announced, "For the first time in 30 years, I don't have a record deal. Don't know that I want one." In March 2012, he performed at the Southern Kentucky Performing Arts Center in Bowling Green, Kentucky, for its opening night. In April 2012, it was confirmed that Gill had been working with Bonnie Tyler on her upcoming album, performing a duet with her entitled "What You Need from Me". In June 2012, he was touring and performing only bluegrass songs. Gill received the 2,478th star of the Hollywood Walk of Fame on September 6, 2012. On October 15, 2012, it was announced that Gill would be featured in a song by Kelly Clarkson titled "Don't Rush", which appears on Clarkson's first Greatest Hits album. The album was certified Gold by the RIAA and has sold 509,093 copies as of October 13, 2013. On November 5, 2014, at the 48th annual CMA Awards Gill received the Irving Waugh award for excellence in country music. This was only the fourth time the award had been granted since its inception in 1983. The previous country music artist to receive the award was Johnny Cash. In 2016, Gill was selected as one of 30 artists to perform on Forever Country, which celebrates 50 years of the CMA Awards. In his career Gill has sold more than 26 million albums and accumulated more than 50 Top 40 hits. Gill joined the Eagles on tour in 2017, singing the lead vocals once sung by Glenn Frey. He has been touring with the band ever since. He plays electric guitar as a guest musician on Aaron Lewis' song "Love Me", which appears on the 2019 album: State I'm In. In 1968, Gill's older half-brother, Bob Coen, was involved in a severe car crash. Bob was 22 years old at the time, while Gill was 11. The accident placed Bob in a coma for three months and left him with irreversible brain damage. He subsequently struggled in life and would lose contact with his family and friends. He died in 1993. Gill wrote the song "It Won't Be the Same This Year" for his brother. He dedicated his 1993 Christmas album Let There Be Peace on Earth and his first televised Christmas special that year to Coen. Gill met country music singer Janis Oliver of Sweethearts of the Rodeo in Los Angeles when they were both starting out in music. The two married in 1980. Their daughter Jenny was born in 1982. In 1983 the couple moved to Nashville. Gill worked as a session guitarist, sang back-up, and continued to write songs while his wife's career reached fame. Occasionally Gill would mix sound for his wife's band. The two divorced in 1997. 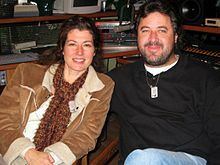 Gill met Christian music artist Amy Grant in 1993 when he asked her to perform in his first televised Christmas special. They formed a lasting friendship. Both parties were in troubled marriages. Grant and then husband Gary Chapman began divorce mediation in 1998, with Grant moving out of the home and filing for divorce in early 1999. The divorce was finalized in June 1999. Gill and Grant began to see each other publicly a few months later. In March 2000 they were married. Together they have one daughter, Corrina. Gill's concert at the Kauffman Center in Kansas City, Missouri, was picketed September 8, 2013, by the Westboro Baptist Church of Topeka, Kansas, ostensibly over his divorce and subsequent remarriage to Grant. Gill has a keen interest in golf and has been playing since early childhood. A scratch golfer, he has organized and participated in many charity events centered around golf and was inducted into the Tennessee Golf Hall of Fame in 2005. In 1993 Gill founded the Vinny Pro-Celebrity Golf Invitational, which serves as the primary beneficiary for the Tennessee Golf Foundation. In 2003 the PGA awarded him the PGA Distinguished Service Award for his work in charity and in promoting junior golf. Gill is a member of the board of directors of the Predator Foundation charity organization. 1992 Song of the Year with John Barlow Jarvis – "I Still Believe in You"
1990 Single of the Year – "When I Call Your Name"
1992 Song of the Year with Max D. Barnes – "Look at Us"
1993 Album of the Year – "I Still Believe in You"
1993 Song of the Year with John Barlow Jarvis – "I Still Believe in You"
1999 Vocal Event of the Year with Patty Loveless – "My Kind of Woman, My Kind of Man"
Gill has won 21 awards from 44 nominations. 1990 Best Country Vocal Performance, Male – "When I Call Your Name"
1991 Best Country Vocal Collaboration with Ricky Skaggs and Steve Wariner – "Restless"
1992 Best Country Song with John Barlow Jarvis – "I Still Believe in You"
1992 Best Country Vocal Performance, Male – "I Still Believe in You"
1993 Best Country Instrumental Performance with Asleep at the Wheel, Chet Atkins, Eldon Shamblin, Johnny Gimble, Marty Stuart, and Reuben "Lucky Oceans" Gosfield – "Red Wing"
1994 Best Country Vocal Performance, Male – "When Love Finds You"
1995 Best Country Song – "Go Rest High on That Mountain"
1995 Best Male Country Vocal Performance – "Go Rest High on That Mountain"
1996 Best Male Country Vocal Performance – "Worlds Apart"
1996 Best Country Collaboration with Vocals with Alison Krauss and Union Station - "High Lonesome Sound"
1997 Best Country Instrumental Performance with Randy Scruggs – "A Soldier's Joy"
1997 Best Male Country Vocal Performance – "Pretty Little Adriana"
1998 Best Male Country Vocal Performance – "If You Ever Have Forever in Mind"
1999 Best Country Instrumental Performance with Tommy Allsup, Asleep at the Wheel, Floyd Domino, Larry Franklin, and Steve Wariner – "Bob's Breakdowns"
2001 Best Country Instrumental Performance with Jerry Douglas, Glen Duncan, Albert Lee, Steve Martin, Leon Russell, Earl Scruggs, Gary Scruggs, Randy Scruggs, Paul Shaffer and Marty Stuart – "Foggy Mountain Breakdown"
2002 Best Male Country Vocal Performance – "The Next Big Thing"
2005 Best Country Gospel Album - "Rock of Ages... Hymns and Faith"
2006 Best Male Country Vocal Performance – "The Reason Why"
2007 Best Country Album – "These Days"
2008 Best Country Instrumental Performance with Brad Paisley, James Burton, John Jorgenson, Albert Lee, Brent Mason, Redd Volkaert and Steve Wariner – "Cluster Pluck"
2017 Best American Roots Song – "Kid Sister"
^ Midwest Communications Inc. "Eagles Guitarist Joe Walsh to Induct Vince Gill into Hollywood's RockWalk Next Month". WIN 98.5. Retrieved May 23, 2016. ^ Kingsbury, Paul (1998). The Encyclopedia of Country Music. New York: Oxford University Presss. p. 200. ISBN 0195116712. ^ a b Sharp, John (May 2, 2013). "Vince Gill Talks About Helping the Mobile Rescue Mission". Blog.al.com. Retrieved December 8, 2015. ^ "The 85th PGA Championship/News/Vince Gill: A man whose life is in tune (8/13/03)". Pga.com. Retrieved August 20, 2013. ^ a b "Vince Gill Official Site". Vincegill.com. Archived from the original on December 26, 2015. Retrieved December 8, 2015. ^ "Vince Gill - Biography & History - AllMusic". AllMusic. ^ "Vince Gill". Grand Ole Opry. Retrieved October 29, 2014. ^ "Vince Gill's Silver Opry Anniversary Celebrated With Epic Show". Rolling Stone. Retrieved January 23, 2017. ^ Chancellor, Jennifer. "Gill joins Time Jumpers for debut album". Tulsa World. Retrieved September 11, 2015. ^ "Show Info: 2011-07-02 | Wait Wait... Don't Tell Me! Stats and Show Details". Wwdt.me. July 2, 2011. Retrieved February 13, 2016. ^ "Moody Bluegrass Two…Much Love". bluegrasstoday.com. June 7, 2011. Retrieved August 25, 2015. ^ Carrie Underwood's 'How Great Thou Art' Moves The Masses - Our Country Archived May 1, 2011, at the Wayback Machine. New.music.yahoo.com (April 25, 2011). Retrieved December 13, 2016. ^ Profile, theBoot website; retrieved August 15, 2013. ^ "Bonnie Tyler – What You Need From Me (With Vince Gill) Lyrics". Songlyrics.com. Retrieved February 13, 2016. ^ Palisin, Steve (June 7, 2012). "Vince Gill concert will be 'all bluegrass'". The Sun News. Retrieved June 8, 2012. ^ "Vince Gill Getting Star on the Hollywood Walk of Fame". Wdez.com. August 23, 2012. ^ a b "Vince Gill Biography and Interview". www.achievement.org. American Academy of Achievement. ^ "30 Country Music Stars Join Forces for Historic CMA Music Video". ABC News. September 16, 2016. Retrieved September 17, 2016. ^ Thompson, Gayle (September 5, 2015). "23 Years Ago: Vince Gill Earns First No. 1 Hit With 'I Still Believe in You'". the Boot. Retrieved December 12, 2015. ^ "The Eagles call on family — and Vince Gill — to carry on without Glenn Frey for Classic West-East shows". Retrieved October 2, 2017. ^ "2018 North American Tour". Retrieved November 21, 2017. ^ a b Graham Kizer, Jennifer (January 4, 2010). "For Amy Grant and Vince Gill, the Second Time's the Charm". Good House Keeping. Retrieved December 9, 2015. ^ "Watch: Vince Gill Confronts Westboro Baptist Church". Us995.cbslocal.com. Archived from the original on October 29, 2014. Retrieved September 10, 2013. ^ "Tennessee Golf Hall of Fame". tngolfhalloffame.com. Tennessee Golf Foundation. Retrieved December 8, 2018. ^ Denney, Bob (2003). "A man whose life is in tune". PGA.com. Retrieved December 9, 2015. ^ "Predators Foundation". Predators.nhl.com. Retrieved December 12, 2015. ^ "Vince Gill Announces New Album, 'Down to My Last Bad Habit'". Tasteofcountry.com. Retrieved February 13, 2016. ^ "CMA Award Winners 1967–2011". Country Music Association. Archived from the original on January 4, 2013. Retrieved February 19, 2013. ^ "Vince Gill". GRAMMY.com. May 14, 2017. Retrieved August 24, 2017.